Social media has relatively humble origins, beginning as a novel way for people to connect online. It has become an indispensable part of how websites and businesses attract visitors; most sites consider social media their second highest source of traffic. The past few years have seen a real social media revolution. Information sharing and content promotion are more dynamic and more connected. Previously, websites garnered subscribers to their content via an RSS feed, which would aggregate blog content, headlines, and other “news.” Today, most people prefer to manage and monitor their subscriptions through social media, with new content notifications arriving through Twitter, Facebook, or Google+ page. In order to increase your traffic through social media channels, it is necessary to integrate social sharing buttons on your website. There are plenty of options to choose from – so this post will explore the top 10 widgets for displaying your social media sharing buttons with maximum efficacy. Why Does My Website Need Social Sharing Buttons? Your website content is all ready to go – now, you need visitors! To get your beautifully-written content onto the screens of your prospective audience – and future loyal followers – you can utilize social sharing icons. Social media gives a voice and platform to anyone willing to engage, allowing users to connect with others who share common interests. Social media creates virtual communities centered around everything from business niches and technical skills, to hobbies and aspirations. Nearly 2.3 billion people use online social networks. If you want to access that massive audience power for your website traffic, it is critical to integrate social media buttons into your site content. Doing so allows your readers to instantly share your site’s content on their favorite social networking site. Social media websites – and their users – can help drive significant referral traffic to your web page. So, creating content which visitors want to share and link to will ultimately improve your ranking in search results. And boosting your social media presence can positively impact your website’s SEO if the two are properly linked through social sharing buttons. 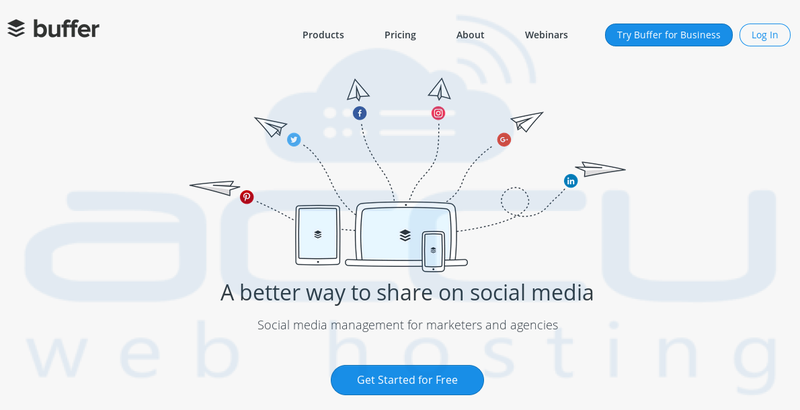 Who are the Best Social Media Share Buttons and Widgets for your Website? 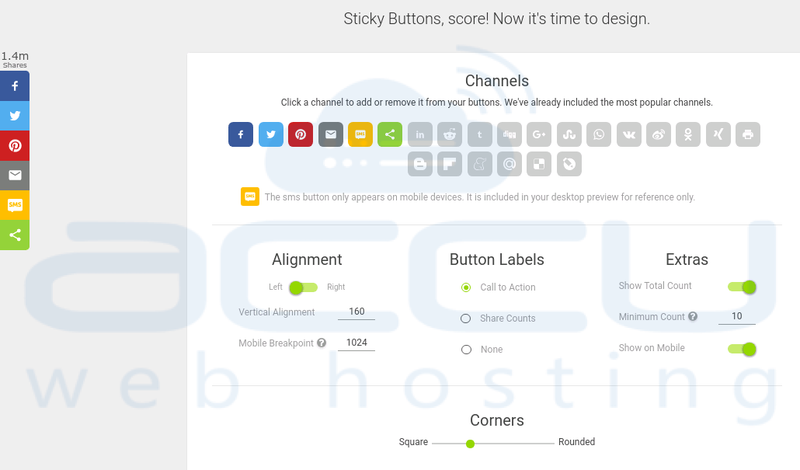 The below is a list of highly reputable social media share buttons and widgets identified by AccuWebHosting.com thru ongoing exhaustive analysis. Please note, variable listing fees may effect the position on the list. This compensation, however, unequivocally does not influence our review process. 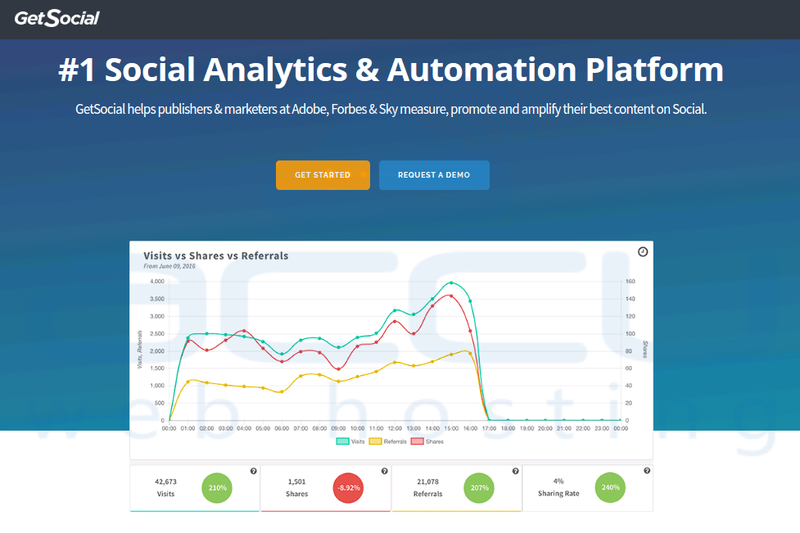 GetSocial is a premium content analytics platform. Once installed on your website, it provides access to a group of tools including share buttons, share bars, pop-ups, and follow buttons. GetSocial is designed to measure, automate, and amplify your content’s traffic through social media. The most powerful features of the GetSocial platform are real-time social analytics and dark social tracking. Because they provide the ability to track and quantify interactions which fly under the radar of regular software like Google Analytics, companies and websites that invest in social media and content marketing tend to love GetSocial. Recent statistics indicate that 80% of social sharing happens on private channels. Referred to as “dark social,” this private sharing of links is the online equivalent of word-of-mouth. GetSocial expertly tackles dark social analytics. And unlike most free plugins, which collect visitor data and sell it to would-be advertisers, GetSocial keeps that data private, meaning that your website loading speed won’t take a hit, and you own 100% of the data collected. The capabilities of GetSocial have been tapped by such giants as Forbes, Adobe, Sky, and WWF. But its social-tracking power isn’t just for the big guns; GetSocial is equally valuable for smaller blogs and eCommerce stores hoping to understand which of their articles, products, and other content is popular among customers and readers. Add This is a social sharing platform with a vast user base – according to Crunchbase.com, over 15 million domains utilize Add This. The platform itself harnesses maximum functionality within a simple, standalone widget. 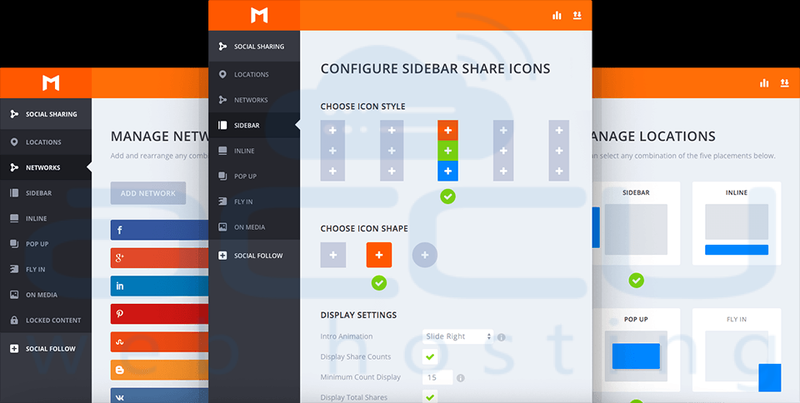 Users can configure their desired social sharing icons to appear anywhere on a web page. AddThis recently added a new feature to the platform in the form of Social Follow buttons, which can be displayed in any location. Users set their own specifications, which will then tailor specific content to each reader. 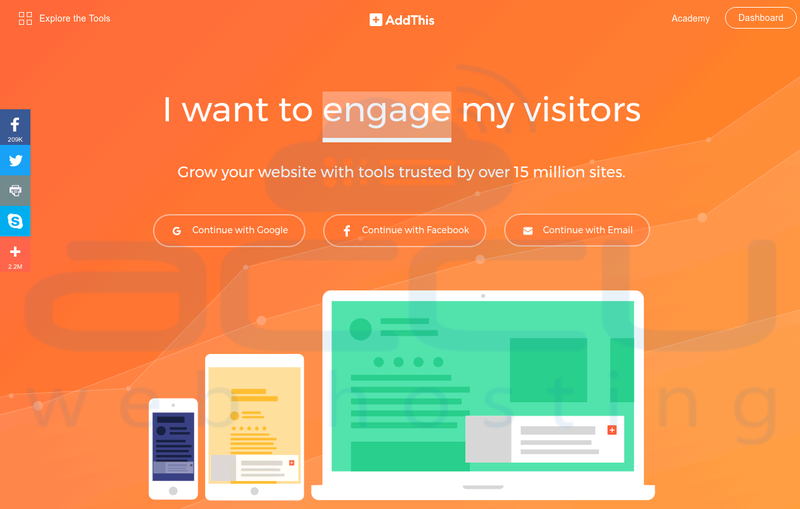 AddThis can target pop-ups to visitors based on which pages they view, and give recommendations to visitors on other content, within related niches, which may interest them. Can i add share buttons on my contest thank you page that share my contest entry page instead of the page they are displayed on? The basic AddThis service is free. Upgrade to a paid plan with additional features starting at just $10 per month. ShareThis has established a prominent reputation as one of the better-known social sharing plugins available. The plugin provides visually attractive social sharing buttons in the form of bars. It integrates social analytics for better insights into the habits and tendencies of your audience. ShareThis supports over 120 social media networks, giving your site visitors more ways than ever to share your content. Versions are available specific to both WordPress and custom PHP sites. Users have the options to place buttons inline on specific locations within a page’s format, or adhere them to the left or right side of the desktop screen, or the bottom on a mobile device, remaining stationary and visible regardless of scrolling. ShareThis can also be visible as a floating bar or a fixed bar, either of which can appear at the top of each page. The ShareThis plugin is free. Monarch is truly feature-rich, making it an effective social sharing plugin. Developed by ElegantThemes, it is ideal for WordPress websites, giving users access to over 85 WordPress themes. The Monarch plugin is optimized to integrate with over 20 social networks. It allows you to display your desired social sharing buttons in five different locations, customizing for your page’s template. At $89 for an annual plan, Monarch offers quite the bang for your buck. Their affordability comes from their penny-saving approach to support, meaning it’s best for self-sufficient developers. AddToAny lives up to their name, purporting to be the universal platform for sharing content on social networks. Choose from over 100 social sharing buttons for your web page, and customize their display and integration for the best function and impact. 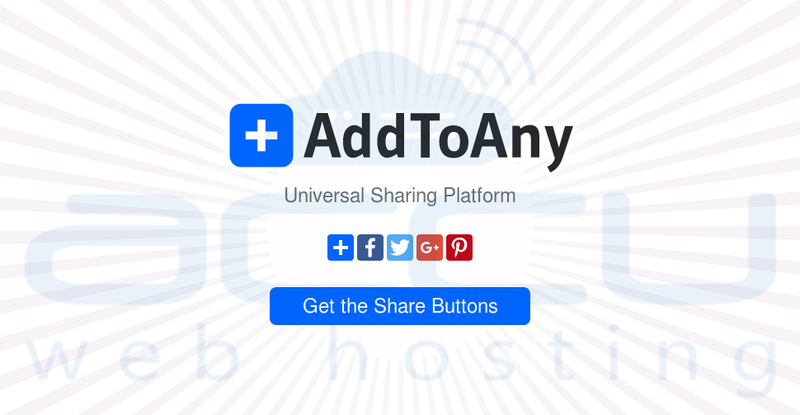 AddToAny’s responsive sharing buttons support mobile browsing. No sign-up or registration is required to use the services. Buffer aims to simplify social sharing. 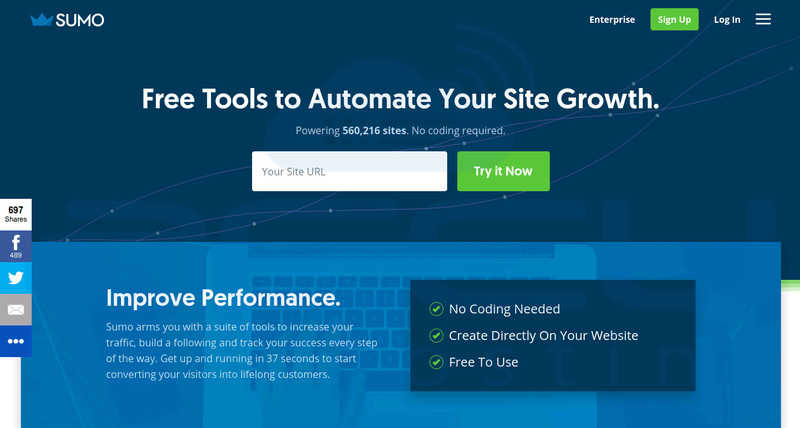 Over 4 million users manage their online marketing efforts through the Buffer widget. Its approach is simplicity through automation. Users can automate posts on a predetermined schedule, thereby driving traffic and increasing fan engagement in less time and with less effort. Buffer has three tiers of service. Their free plan is best for individual users looking to expand their social media presence. For $10 per month, you can manage ten different social profiles and pre-schedule 100 posts per profile. The Buffer business plan clocks in at $99+ monthly. For serious marketers only, this allows you to manage over 25 profiles, each with 2,000 scheduled posts, and distribute access to more than five additional team members. Shareaholic is making their mark as an effective online marketing tool. Webmasters, developers, and designers around the globe utilize Shareaholic to boost user engagement and increase website traffic. The platform provides access to more than one hundred buttons for display on your site. The addition of shareable images is an attractive feature for any social profile; add smart sharing buttons to any image and increase your shares and views. Shareaholic offers a free trial. Premium access will cost you $95 each month. Feel like you’re doing battle to keep and increase your website traffic? Social Warfare can take you from grunt to samurai. A robust, feature-rich plugin, it allows users to fully customize options, giving you complete control over what it does and how it does it. Both the code and the visuals can be adjusted to match your website flow and branding. Social Warfare offers more than 5,000 potential styling combinations. It’s customization features allow you to create responsive, mobile-friendly buttons, and shortcuts enable you to drop social sharing buttons right into the code of your site. Social Warfare is relatively affordable for the lower tier of paid social button widgets. Use the software for $29 per year; if you are unsatisfied, take advantage of their 45-day money back guarantee. The SumoMe platform arms you with a suite of marketing tools designed to increase your website traffic and track your networking successes. SumoMe gives users a wide range of mobile-friendly social sharing buttons to choose from, integrating access points for more than 65 different social networks. The basic SumoMe plan is free. Upgrade to a premium, paid plan, with all additional features, starting at $29 per month. Sharexy is a free widget designed to integrate social sharing buttons on your website. While it lacks some of the advanced features of its more expensive relatives, Sharexy provides all the basics for social sharing. The platform allows users to choose from different types of buttons – floating, static, or both at once. Select any of their pre-designed options from the gallery. For a free service, Sharexy boasts an impressive customization feature. Through the Sharexy widget constructor, you can design your own buttons. The plugin also offers a Buzz feature, adding visual interest and movement to social buttons and encouraging your website visitors to share your content. Sharexy is a free service for those looking to expand their online social presence. Everyone seems to have a different opinion on what works and what is a waste of time when it comes to social media sharing. This list is designed as a starting point, for you to develop your own best practices and preferred tools. We encourage you to experiment with a few of the tools on this top ten roundup. Review the demos, if available. Experiment with the plugins’ styling features and customization. Measure loading times after adding different social sharing buttons. If a button dramatically slows down a page’s loading speed, avoid using it. Pick a visually prominent position for the buttons on your website, but make sure the size is appropriate – and attractive, rather than unpleasantly distracting. Ultimately, your stellar, well-curated content is more likely to go viral when you link it with social media sharing tools. We hope this overview of the top social sharing buttons helps you find the right tool for your marketing efforts. Like what you’ve read? If you’re using lead capture tools to grow your email list, check out our list-cleaning recommendations in the Top 10 Email Verification Providers. Are you already using one or more of the plugins we listed above? We would love to hear about your own experiences in the comment section below. You’re absolutely right on social plugins, sure it helps to improve website publicity in social medias, But what about the loading speed of the website. I strongly believe the scripts in these plugins will affect the loading speed of the website. What do you say about it? Does premium plugins cover that flaw? Yes, it may affect page loading speed, but not much as they are very small in size(in KiloBytes). You can also minimize the effect by loading them asynchronously. This even applies to premium plugins. Sharing button images are normally stored on the server so they load immediately. It’s only the counter which use API call to display the count. If you don’t load the counter, there is no need to spend time on the API call. Social sharing buttons are important as they provide more benefits which can compensate reduced page loading speed. Interesting read, and I have, in fact, noticed that more and more websites integrating social sharing buttons. By what percentage can social media channels increase traffic to one’s website, or does it depend upon which widget one utilizes? Social media sharing buttons can significantly increase traffic of your website/blog as it becomes easy to share with more people. It also depends on where you place buttons on your page and how you use widgets. Floating buttons are visible through out the page compared to static buttons. There are many widgets which allow sharing images or a quote from your website/blog to social media by users/viewers. AddInto is still mentioned in many circles and while I didn’t see it on your top ten list, I’m wondering what your thoughts are about it? Especially considering its one of the free apps still available. Following up to George’s question. It’d be interesting to see comparison load times for different social media site’s APIs. Hello Jay, It seems like Addinto has issues with their site and that is the reason we have not included them in our blog listing. We would surely test out the comparison load times of different social media widgets API’s. We will update our findings soon. Thanks for the great resource, obviously all sites need one button links to social media but my question for you is which is simplest for a newbie setting up his first wordpress blog and who has limited technical ability? You are welcome Nathen. Most of the vendors provide WordPress plugin which can be installed, so there is no need for coding skills. You can select anyone from the list, which suits best for your needs. I can’t imagine my website without social media share plugin. Well, I’m using AddThis plugin and pretty much satisfied with the performance. Never had any issue though. But the collection you’ve showed have plugins that I never heard of. Will definitely try few of them if needed. Always wondered how to add social media buttons to a website. To be honest didn’t really know where to start, but this write up is brill! Thanks for this article. It’s really helpful. How can I add sharethis.com to a blog hosted on blogger.com Each time I add inbuilt share buttons, they don’t appear with the social media logos and icons on my site. Hello Eve, glad to know that you liked our article. You just need to register at ShareThis and select the social media logos you need and generate the code and use it. It is as simple as that. Excellent tips. I love all the points you have mentioned in your post. I prefer to use SumoMe because Sumo is equipped with great social sharing functionality. it is also packaged as three separate apps — Share, Image Sharer, and Highlighter. Hey Olivia, thanks for sharing your insights for SumoMe. This will surely help other readers to make their decision. Awesome article keep it up in future and thanks for sharing with us. Compared to other sharing plugins, Social Warfare Pro has outdone itself. No other social sharing tool can provide great features such as social optimization tools, twitter share count, click to tweet features, and twitter cards. I give this plugin thumbs up to its developers. It has been my choice, and have used it for years hence, am sure it will be yours too. Get it to maximize your WordPress website or blog experience. Why Should We Put Social Sharing Buttons On the Website? Success! We have sent an email verification link to your email address, please click it to verify. Thank you.